Raising children with autism spectrum disorder (ASD) is a challenging task. Experiencing delays in developing age-appropriate skills, children with ASD find it difficult to learn and do simple tasks such as sleeping, brushing teeth, dressing, playing with peers and other social skills, which normal children efficiently manage as they grow up. While this is emotionally straining for the parents, experts suggest early intervention is the best way to help your child in their development. Support Centre, adding that communication challenges could be the most challenging. “Imagine, how many times do we ask for something each day? 100? 200? And now imagine not being able to do that once a day,” says Orland. “It would be incredibly frustrating and may even lead to emotional behaviour such as tantrums or aggression. When we see challenging behaviour the goal is to replace it, in most cases with appropriate communication behaviour. 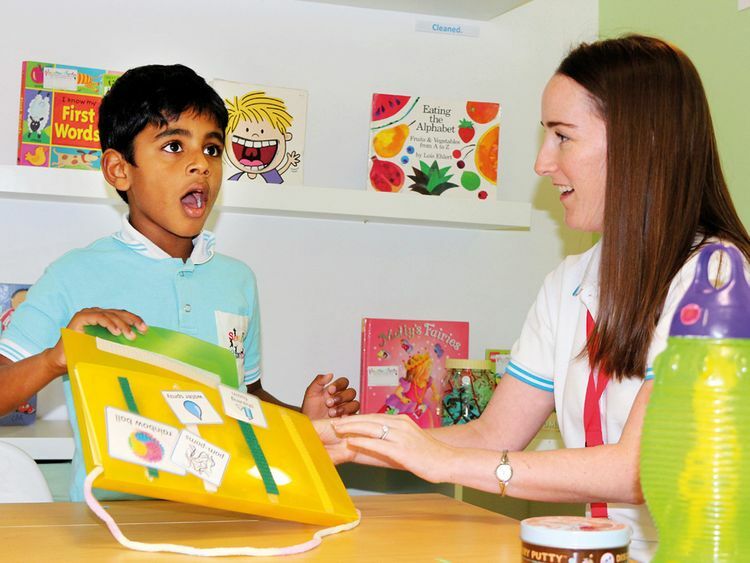 The purpose of early intervention is to lessen the effects of the disability or delay, says Dr Shatha AlNassar, Speech and Language Pathologist at Head Start Speech Therapy Centre. “The goal is to ensure that children with ASD can access evidence-based interventions to provide the best opportunity for optimal development and outcomes. Children who receive autism-appropriate education and support at key developmental stages are more likely to gain essential social skills and react better in society. Difficulties in verbal and non-verbal communication are characteristics of ASD. Nisha Mistry, a DHA-licenced speech and language therapist (SLT) from the UK, and Clinical Director, Sensation Station Centre in Dubai, considers taking a child-centred approach and stepping into the child’s world as an excellent start for therapists and parents alike. “By embracing a child’s perspective and understanding how they see their world, an SLT can develop a child’s social interaction, attention, motivation and engagement to work on language development and communication barriers. Embracing a child’s perspective and understanding how they see their world allows a Speech and Language Therapist to develop a child’s social interaction, attention, motivation and engagement to work on language development and communication barriers. The main aim of occupational therapy is to ensure children enjoy a meaningful and productive participation in the community, says Marina Loukas, Administrative Director, The Doris Duan-Young Autism Centre. “We promote holistic health (physical, mental and social), restore independence in activity participation, and aim at optimal functioning for all our clients. “We introduce, carefully grade and develop the skills that these children need to be able to complete daily activities like brushing their teeth, dressing by themselves, interacting with others and developing age-appropriate skills,” Loukas adds. Chiara Battaggia, Occupational Therapist at the Head Start Speech Therapy Centre, says, “Some children are hypersensitive to sensations, touch, auditory, olfactory and taste input; others can be hyposensitive, seeking greater sensory input, often socially misunderstood or facing safety concerns. This first step in understanding how the child feels leads to lower parental stress and helps them learn some initial strategies to support their child to enjoy everyday life.